I’m not sure how many times I will be able to use this title for a post, but let me tell you, in case you don’t know, we LOVE Hood River. We usually try and get away for a weekend, but I think we often forget how close it is and how quickly we can drive out and just enjoy the day. That is what we chose to do. I really wanted to go because Pfriem, which is my favorite brewery, was having their one year anniversary and they were celebrating with a party. Well, you can’t just go to Hood River for the beer alone. Actually you could, since there are so many breweries, but it would be a shame to miss out on all the great places to chow down. Pfriem was having a full on party down by the river. 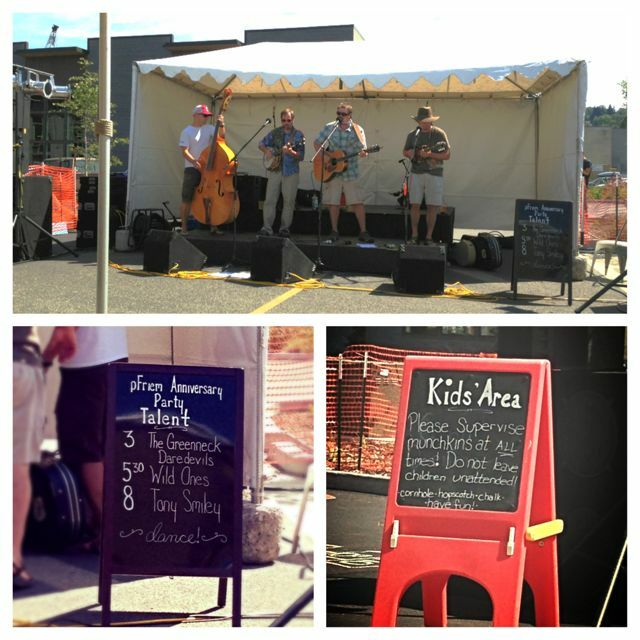 They had music, a kids area and some of their beer being served outside along with some brats and stuff. Inside was packed out with people enjoying their full menu, which we still have not tried, so I guess that means we will go back again. We did grab a beer and listen to music and just people watch for awhile. You know, just kind of take it all in. Corn hole did come out, and even though it was in the kids area, the adults quickly started a game. There was even dancing. So literally something for everyone. From their we wandered up to the downtown Hood River. It’s not too bad of a walk. We chose to walk because it’s nice to get exercise and be outside on such a beautiful day, but also because parking is free by the river, but costs in town. So by saving a few bucks and walking a bit, we earned ourselves another beer. That’s how it woks in my world. Awesome Pizza and good beer. We stopped by Double Mountain Brewery, which is also a favorite of mine. I love that they are now bottling their beer. Even though they have made their space nearly 3 times as big, this place still packs out and has a wait. So wait we did. 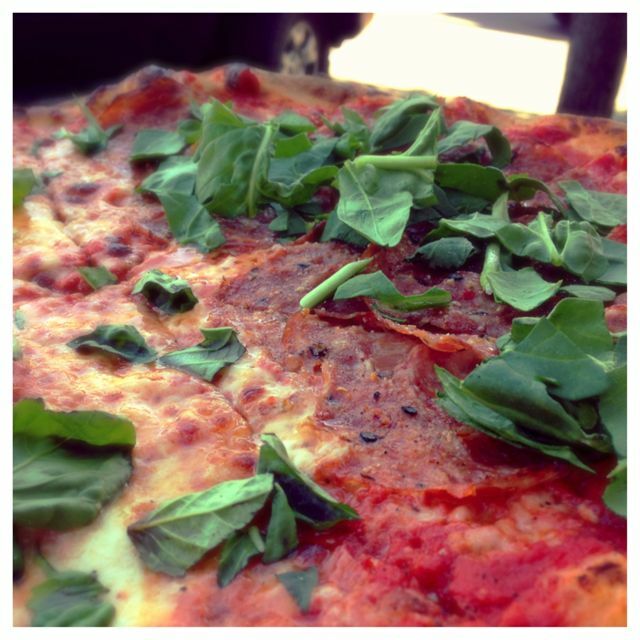 We ordered half Margarita and Half Salami Pie, since it featured Salami Cotto from Olympic Provisions. Their pizza is always good. They cook them in 700 degree ovens, so there are some dark spots, so be warned. We then walked around, shopped and just enjoyed the day. I was excited to see that there are even a few food carts hanging out in Hood River. We even sat and people watched for a bit on a grassy hillside. We just took it all in and went at a slow pace. Since we had a late start even leaving Portland, we knew we would need to head back soon. We decided to grab one more small dish from another favorite before we left. We headed over to Brian’s Pourhouse. 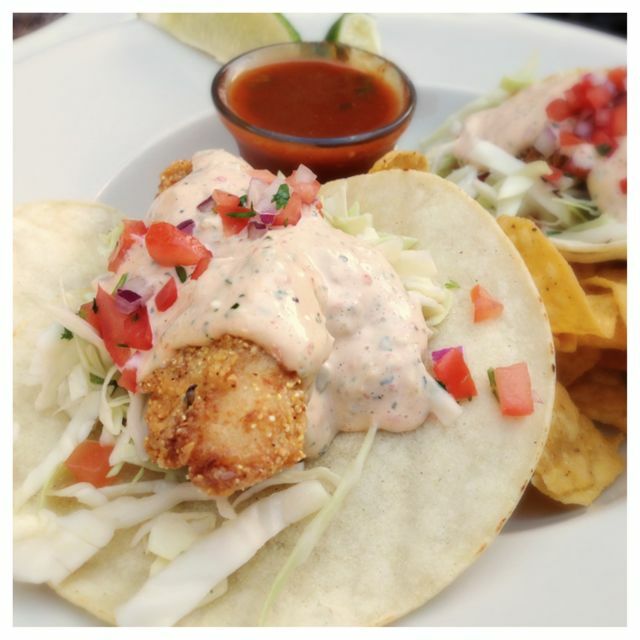 We love their fish tacos, and we knew we would only get 2, so it was perfect. 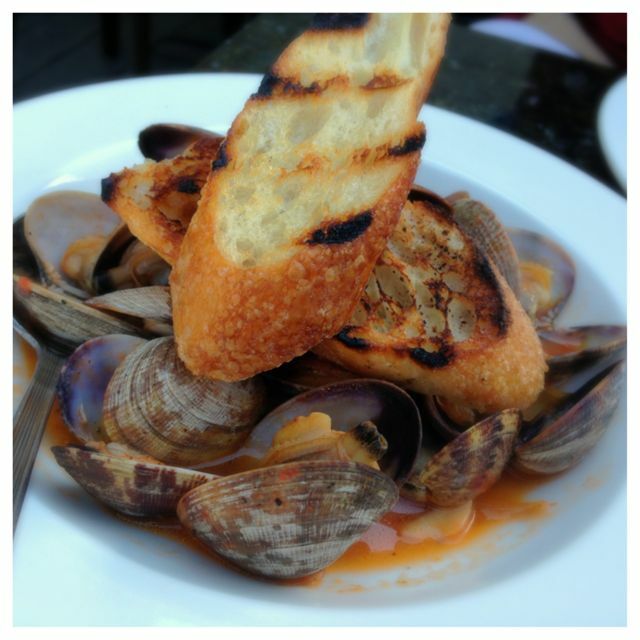 We also saw that they had Steamed Clams on the menu, so we ordered them, even though I really wanted the Brussels sprouts. Everything there is good. Plus we sat out back on the patio, which I didn’t even know they had. They were also getting ready for some live music, but we had to leave town. 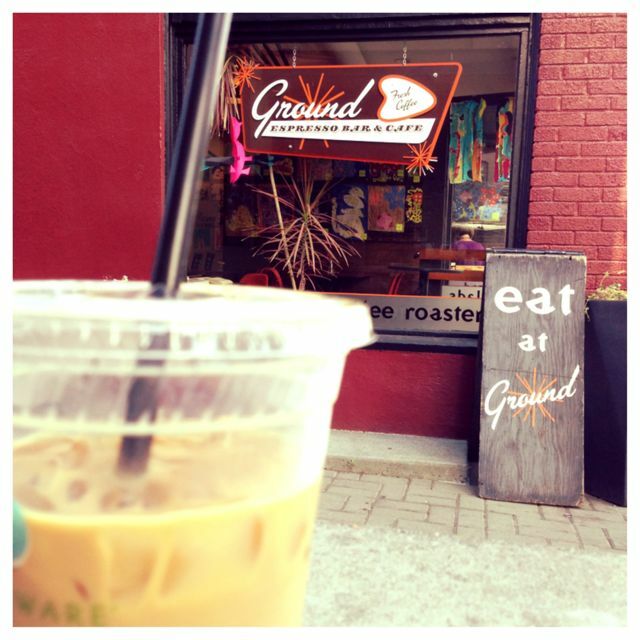 On or way out we stopped by Ground Coffee and got a latte to share for the walk back to our car and home. I noticed while we were in there that they had quite a selection of sandwiches and they also offered a few beers on tap. Pretty cool coffee shop. I didn’t like that they don’t carry white chocolate powder. I’m picky about my lattes, but I still enjoyed a good iced latte. 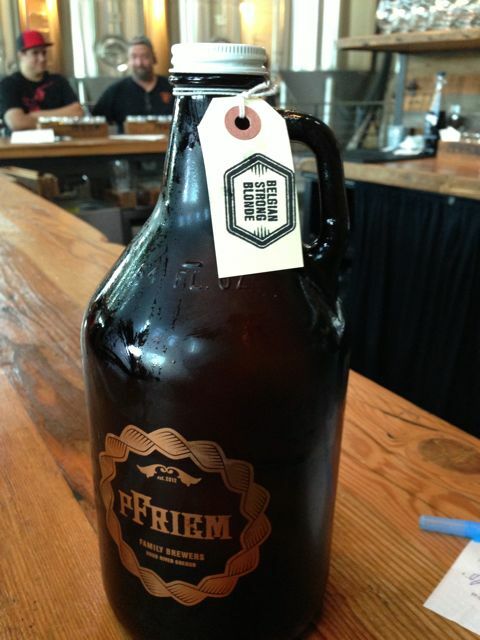 Pfriem Growlers. This was my very first growler. I think I’ve started something with this. 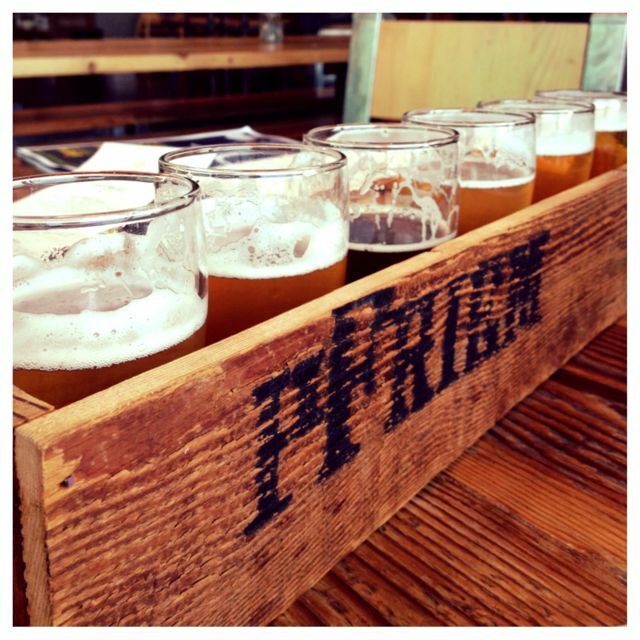 We stopped by Pfriem one last time to check on the music and party and grab a Growler. My very first growler. I then had the opportunity to meet Josh the owner of Pfriem. He didn’t know who I was, but it didn’t matter, I just needed to shake his hand and say thanks for making such an awesome beer. Make sure you sign up for my email updates or follow along on Facebook. I am going to be giving away something pretty cool in the next couple of weeks from Hood River so you too can fall in love with it. Double Mountain had fantastic pizza! Stopped there on the way home from snowshoeing on Mt. Hood.